A 59 year old woman presented with RUQ pain. Imaging showed a dilated gallbladder with numerous stones. Incidentally, a single, 3.5 cm mass was noted in the upper pole of the right kidney. She underwent cholecystectomy as well as resection of the renal mass. Grossly, the renal mass was well circumscribed and non-encapsulated with a tan-yellow, solid, lobulated cut surface. There was focal cystic change but no evidence of hemorrhage or necrosis. 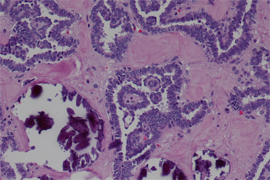 Histologically, the tumor was comprised of small, uniform, closely packed tubules and papillae in a background of loose stroma. 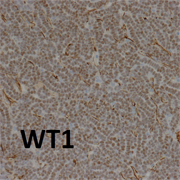 The cells were uniform and small with bland nuclei and even chromatin with minimal cytoplasm. There was no atypia and only rare mitotic figures. There was no invasion or infiltrative growth. 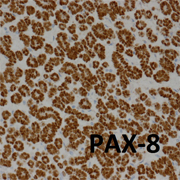 Immunoperoxidase stains showed nuclear staining for PAX-8 and WT1. 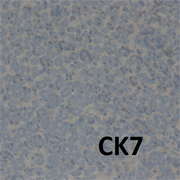 Stains for CK7 and p504s (AMACR) were negative. 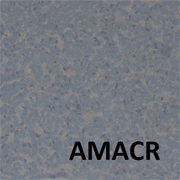 A diagnosis of metanephric adenoma was rendered. Metanephric adenoma constitutes approximately 0.2% of adult renal epithelial neoplasms and are incidentally found in 40-50% of cases. The mean age is 41 with a range of 5 to 83 years. Most patients (two-thirds) are female. The average size is 5 cm with a range of 0.3 to 15 cm. Twelve percent of cases are associated with polycythemia as a paraneoplastic syndrome. 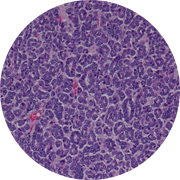 Molecular analysis for BRAF V600E is both highly sensitive and specific for metanephric adenoma.